Please note that on certain event days, we will be offering special wine tasting activities in lieu of our normal appointments. These events require visitors to RSVP. As we embark into the summer months, nothing reminds us that the temperatures are warming more than the annual release of our unique chilled red wine: P2. First made in 2009, this peculiar cofermented Pinot Noir-Pinot Gris blend has developed a devoted following amongst Copain enthusiasts. Please plan to join us as we open our first bottles of this year’s release while taking in our bucolic views and fresh air. Expertly fried chicken from Backyard Catering and other seasonal sides will be served as a delightful afternoon lunch. Please plan to join the Copain Team for a special tasting flight of our Pinot Noirs and wood-fired pizzas. We have worked to tailor a menu of wood-fired pizzas topped with fresh, locally-sourced ingredients to pair perfectly with a curated menu of Pinot Noirs! 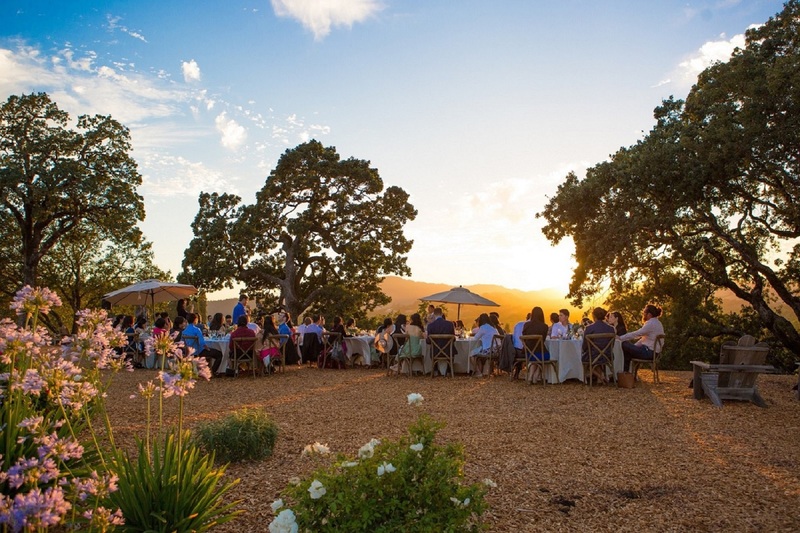 In addition to food, wine, and hospitality, our hilltop views of Russian River Valley will certainly make this can’t miss event on a beautiful Summer afternoon in Wine Country! Advanced Ticket Purchase Required. Party times: 11:00am-1:00pm* & 2:00pm-4:00pm. Last pour at each party is fifteen minutes before the party's conclusion. $50 per person, $25 for Members; Copain Club de Vin Members may use the Promo Code "Member" to receive Preferred Member Pricing! *Members of Copain's Club de Vin who wish to participate in the exclusive Tour & Tasting at 10:30am should purchase tickets for that event instead. This special event is open exclusively to Copain’s Club de Vin members. At 10:30am, Copain Wines will be offering members the exclusive opportunity to tour our winery facility with the guidance of our winemaking team. Those who sign up for this option will also have the opportunity to taste finished wines from barrel. Those on this tour will be included for the 11:00am Harvest Party. Guest check in at 10:15am for a prompt tour start at 10:30am. About the Harvest Party: As our vines slumber into dormancy and harvest activities come to a close, we would like to invite our members and guests to celebrate with Copain at our annual Harvest Party. Please plan to join us as we share our most recent wine releases as well as a selection of old favorites. Live music and small bites, crafted to pair with our wines, will be enjoyed as you will have the opportunity to try our newest releases while taking in our bucolic views. Select library offerings will be available for guests to taste. Advanced Ticket Purchase Required. Very limited capacity. $35 for Members & their Guests. Members will need to register online with the email associated with their Membership or by calling our Hospitality Team at 707-836-8822 x1. Limit 6 guests per reservation. Member of Copain Club de Vin: Please use the promo code “CopainMember” to receive your special Member ticket pricing!